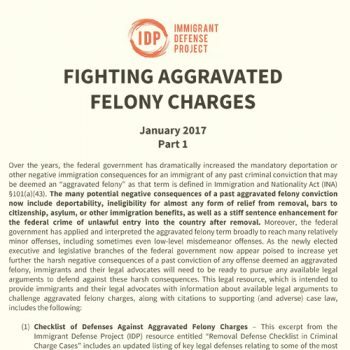 “Fighting Aggravated Felony Charges,” is intended to provide immigrants and their legal advocates with information about available legal arguments and supporting case law to challenge aggravated felony charges in removal, asylum/withholding, naturalization, and other immigration proceedings, as well as in federal criminal proceedings. Over the years, the federal government has dramatically increased the negative immigration and criminal consequences for an immigrant of any past criminal conviction that may be deemed an aggravated felony. The many potential negative consequences of a past aggravated felony conviction now include deportability, ineligibility for almost any form of relief from removal, bars to citizenship, asylum, or other immigration benefits, as well as a stiff sentence enhancement for the federal crime of unlawful entry into the country after removal. As the newly elected executive and legislative branches of the federal government now appear poised to increase yet further the harsh negative consequences of a past conviction of any offense deemed an aggravated felony — including a planned increase in use of INA §238(b) administrative removal proceedings for those allegedly convicted of an aggravated felony, and increased prosecution of §276 illegal reentry offenses subject to an aggravated felony sentence enhancement — immigrants and their immigration and criminal defense lawyers need to be ready to pursue any available legal arguments to defend against these harsh consequences. 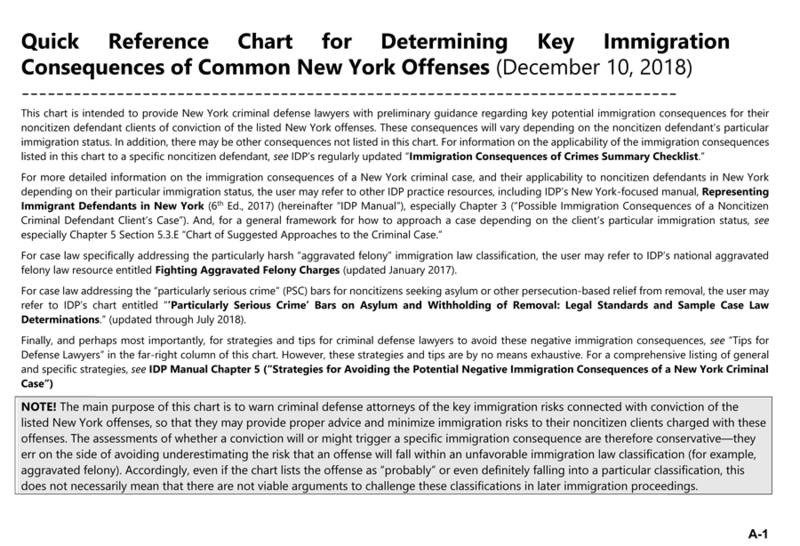 (1) Checklist of Defenses Against Aggravated Felony Charges – This supplemented and updated excerpt from the prior IDP resource entitled “Removal Defense Checklist in Criminal Charge Cases” includes a listing of key legal defenses relating to some of the most commonly charged aggravated felony grounds along with supporting (and adverse) case law citations. (2) Sample Aggravated Felony Case Law Determinations – For those seeking to delve more deeply into case law across a broader range of the aggravated felony (AF) grounds listed in the INA, this updated IDP aggravated felony case law chart includes detailed information about hundreds of federal court and agency AF determinations over the years relating to virtually all of the AF grounds. 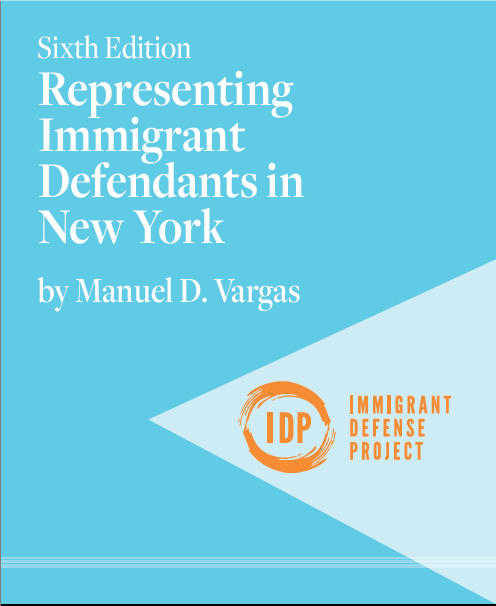 IDP is committed to providing immigration attorneys and others with digital access to high-quality information that keeps pace with case law. The purchase price will allow us to ensure IDP’s legal resources are continually updated. If you are experiencing significant financial hardship that prevents you from accessing this guide, please email Michelle Parris (michelle [at] immdefense [dot] org). Confirming that neither you nor any employee or member of your organization is involved in the prosecution or deportation of individuals or associated with any local, state or federal prosecution or enforcement agency. Agreeing not to distribute, reproduce, or otherwise provide or allow access to the resource to anyone, with the exception of individuals employed by your firm or organization. Agreeing that you may provide temporary use of the resource to interns or volunteers during the time they are engaged by your organization or firm for the purpose of their work on behalf of your organization or firm. Agreeing to notify Immigrant Defense Project immediately if you learn that an unauthorized person or entity has accessed the resource using your account or any other information provided by or obtained from you or your anyone at your organization. Upon making your payment, you will be provided with an email with instructions about how you and the other advocates within your organization or firm can access the digital resource.